Sending your manuscript out to agents and editors for possible representation and publication is exciting, but mostly terrifying. You hope that your query will make a good enough impression and that an agent will be intrigued and request the full manuscript! How do you guarantee yourself the best chance of hooking—and then landing—an agent? There are a lot of steps involved—and for good reason! Agents want to work with someone who is a fantastic writer and a professional. Each step of the process is critical. So, say you have a fantastic query letter and the agent requests the first 50 pages. Hurray! That’s awesome. BUT you didn’t have your manuscript professionally critiqued or even read by beta readers. You didn’t review the copy for errors in spelling, punctuation, and grammar. Basically, your manuscript is not complete. Your wonderful “big shot” just got a big thumbs down. It’s a sad scenario and I hope this doesn’t happen to you, but unfortunately I know it has happened to writers before. See, it is not an agent’s job to help you put together a complete manuscript. But you know who can help you do that? An editor. 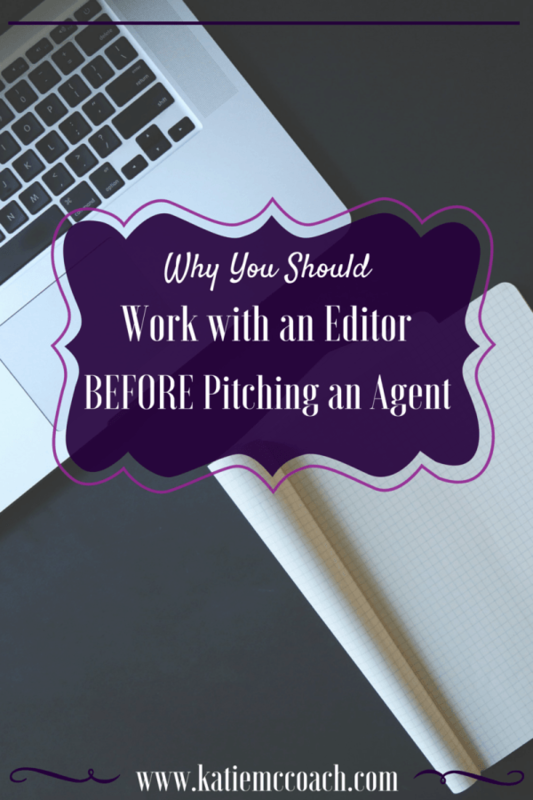 Working with an editor before pitching an agent can make a huge difference in your chance at representation. No, it is still not a guarantee you will get represented, but it is a guarantee that you’ll be giving yourself the best chance. You don’t have limitless chances of pitching agents–make the most of your first reach. Many agents have specific guidelines that state they will not look at a pitch twice (same manuscript). Some may be more flexible, if there was promise, or if they were somewhat interested and invited you to try again in the future…but wouldn’t you rather something stick the first time? It is your first impression—make it your best one by being certain that what you are sending is your best effort. A second set of professional eyes, from someone who knows the business and how agents think, can set you on a confident path. Does your query entice the reader? Are your first 50 pages strong enough to grasp an agent and keep them? Immediately in the first 50 pages, agents look for the typical no-no’s. Is the writing strong? Does the character have a unique voice? Is it clear what the story is about, who the protagonist is, and what the goal is? Have you written in the right genre and for the right target audience? Agents want a manuscript that is as complete as possible. They can’t afford to develop you (your work). Remember they don’t get paid until your book sells. And that could be months. Already they are taking a risk in working with a new writer and hoping they can get a publisher interested, so spending time working on revisions with you makes that risk steeper. A good editor is there to help you develop your work—to help you create the best story and writing for publication. They give you the best chance. Remember, when you succeed, the editor, agent, and publisher succeeds. Thank you! That was very helpful and something I’ve wondered about often. Great article – I am going to do this! I do actually – what has stopped me from sending stuff to an editor is my own confidence. I imagine the editor sat staring at my work and shaking their head. Then I imagine getting an email back with the words ‘I can’t help you’. Does this happen? In response to your question wondering editors receive something and think they can’t help: No way, this does not happen! If it does, it may be because the editor doesn’t feel comfortable working on that subject matter or genre. Every now and then I’ll receive a sample and realize that I’m just not the best editor for the job. I try to always recommend other editors, in that case, because I don’t want a writer to feel lost and pushed aside. And in the end, I want you to find the right editor for you. That’s all that matters. If you do have an editor that just says, “Sorry,” and pushes you aside, then I am very, very sorry, but that just means that was not the right editor for you, so you dodged a major bullet. Interview editors and ask for a sample edits. The best editors are the ones that want to help you publish/sell the best writing you can. That’s the whole reason I am an editor, and I’m sure many others would agree. If you aren’t ready for an editor yet, try online writing groups or publishing sites like Scribophile, or Wattpad. Get some trusted friends to read your work and provide feedback. Critique partners. Etc. Keep writing, and don’t give up! Couldn’t agree more. Editors really help! By the way, thanks for liking my post!